Looking for online keno information but finding it is produced by those who think you’re from “Canadia”? Then keep reading, because we understand that Canadian players want precise and factual information when playing keno online. 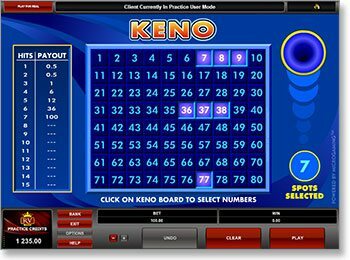 Playing keno online can seem quite anti-social in comparison to the traditional way of playing it at the local watering hole. However, when playing online you void the requirement of having to convince your mates to scan your ticket when their shout is up – and you can play from home, on the couch, without having to dress up or travel. Thanks to the Internet, we can now pick our numbers without the need of an annoying paper form, and there is no need to constantly get up to check if we have won or not. We can even invite all our friends over and play online as a group. Canadians get a lot of slack regarding how quick they are to catch on to things, but by learning about the most reputable sites to play online casino games we think you’ll be ahead of the game. If you want to learn how to play keno read on,; otherwise, scroll down to inform yourself of the best places to play keno on the Net in Canada. The game is simple – first head to your preferred online casino. We have listed and reviewed each online casino and their keno varieties below to make it a bit easier for you. Once you have found the perfect keno variety to suit your preferences, click on the title and you will be taken to the casino’s keno interface. Depending on which casino you have chosen, the graphics can be innovative and creative or they can be quite simple. Microgaming keno, for example, utilises a colourful but simple interface for its electronic keno for easy navigation. This may also come into play when deciding which Internet gambling establishment is for you, especially if you are more inclined to simplistic betting. The standard games will see you picking up to 20 numbers out of 80, although that just makes our odds way too high if we pick that many, so try to pick under 15 numbers for better odds. The numbers are then picked at random by computer generators that have been tested to ensure you are enjoying a fair game, or pulled out by a live croupier from a big barrel of keno balls if you choose live dealer keno – available at certain sites only, such as G’Day Casino. If the numbers called out match some, or all of your numbers you have picked, you will be paid accordingly. Keep an eye on the pay tables at each online casino so you can learn how much you will win. Additionally, keno doesn’t pay to one, so you aren’t winning your money back – rather you are risking it. For example, if you put $2 on one number you will most likely only be paid 0.5 of the $2, depending on the casino’s pay table, which is only $1. Therefore, it is recommended you pick more than one number if you want to make betting in keno worthwhile. If you want to play keno for real CAD money, then make sure you do it at an online casino with a good reputation or you could be risking your own. We have compiled some of our favourite online casinos to help you decide where to play, while assuring you that they are all trustworthy, governed by regulatory bodies to ensure a fair and secure gaming experience, as well as innovative and entertaining. If you want to experience premium keno, we recommend Royal Vegas. The site is our favourite as it ticks all the boxes including utilising the incredible software platform, Microgaming, and providing 24 hour customer support through phone, email and messaging services. We can either download the software, which offers a greater catalogue of games, or we can play instantly via our browsers. There are more casino games on the downloaded version; however, both only have one keno title so this shouldn’t matter if you are just playing keno. There is a native app for mobile or tablet punters to download called Regal Vegas – named differently for marketing purposes – by tapping on the button on this page on your mobile Web browser. Unfortunately, it doesn’t have a keno title available to play just yet. Microgaming are working on porting over their keno software to mobile devices, so we will update you when mobile keno is available. The great thing about having the software installed, besides having access to an array of great games, is that it is quicker to access. The audio sounds much like the audio at a land-based casino, though this isn’t that fitting when playing keno as we don’t generally hear that kind of atmosphere when playing at the pub, rather we hear a rowdy crowd so you can turn that off if it isn’t what you are after. Clicking on the ‘games’ tab will take you to all the titles available. You can either search for keno or have a browse through all the titles. You’ll find keno under the ‘Variety Games’ title while you will find it under ‘Other’ in the Instant play version. Begin the keno game and pick your spots, while taking in the amazing graphics that are sleek and classic. The pay table at Royal Vegas is very fair and usually pays well, so for an incredible, secure, and fun keno experience this online casino is a great option. You may say that if we love Royal Vegas so much it seems silly to include others, but we do enjoy mixing it up and seeing what other casinos have to offer and we even find some are very close to being number one when playing keno online. This includes Guts Casino and while the name isn’t very appealing, the keno variety is. Guts only allows to play via your Web browser, so there is no need to download any software to enjoy the full range of titles. Guts doesn’t have a standard game of keno, but it does have Bonus Keno, which is a progressive title allowing you to win massive jackpots from a continuously growing prize pool. Powered by Net Entertainment, Bonus Keno works by playing keno like normal, picking your numbers and keeping an eye on the pay table, but it also contributes to jackpot which every player who participates in this game contributes to, not just in Canada, but all around the world. The jackpot is revealed when a J forms via ten boxes drawn. It also features a bonus round where if you get five jokers you are able to double your winnings, though this doesn’t apply if you do win the jackpot. Additionally, you can only pick 10 numbers as opposed to the traditional 20. There are also five coin values available to bet and like every other casino the pay table does depend on how many numbers you are betting, for example if we bet four numbers at Guts, to actually make a profit we need to match three numbers, where as if we were to pick 10 numbers, we would need to match six numbers in order to make a profit. Hitting 10 numbers can seem appealing, but like all keno it only increases your odds – meaning it is very unlikely you will hit all 10. 7 Sultans offers both the downloadable software, which is easily accessed from your desktop provided you have a solid internet connection, or via instant play mode through your browser. Unlike Guts, where you don’t have to create an account straight away, to play keno online you will need to sign up at 7 Sultans. But this means you can get playing keno straight away with real CAD cash. You will find a standard game of keno under the ‘casual games’ category, but you can only pick 15 numbers here as opposed to 20 or 10. Make sure you have enough funds in your account before you start playing. Alternatively, you can make a deposit during a game via the bank option. The pay table for this keno title is quite similar to other Microgaming-powered casino websites, with the requirement of certain amount of numbers matched to make a profit. 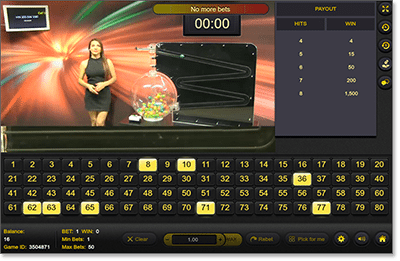 Canadians who are after a totally different keno experience, similar to that of a land-based casino, should check out live dealer keno, powered by Ezugi. Although it is only offered at G’day casino, an online gambling establishment targeted at Australians, we recommend checking it out as the theme doesn’t impact the game. Head to G’day casino, quickly sign up, and then deposit using one of the many methods offered, so you can play the live dealer keno version as it is only offered in real money mode. Click on the live casino tab on the left hand side which will take you to another link that opens up a separate window. This window will hold an array of other live dealer titles including baccarat, blackjack and roulette. Click on keno and you’ll be taken to the game room where a beautiful dealer calls out the balls which look similar to a lottery barrel. There are three minutes between games, so you will have to wait if you come in during a game. You are also able to see the numbers that were called out in the previous game, and you can even alter the settings, such as audio and video quality. It can be hard to hear the croupier over the balls but you can easily see them at the end of the game on the screen. The live dealers are recorded in real time so it is perfect if you want a social and human element added to the game, which you won’t even find at your local pub. Mastercard and Visa are internationally recognised and all of the above online casinos accept the two so Canadians holding credit and debit cards with these companies will be able to make deposits quickly via these methods. All you have to do is head to the banking page, input the details of the cards, enter the amount you wish to deposit and sit back and wait for verification. Prepaid services are also becoming an increasingly popular method to pay online, and all of our favourite gambling establishments accept Ukash, a prepaid card which you load money on and dispose of once you have used all your funds. You can’t withdraw to these cards so the next method might be best if you are planning on making withdrawals and don’t want to use credit or debit cards. E-wallets are a great alternative as they offer a service where you can transfer funds without having to put your card information in the online casino. Neteller is a great e-wallet option, although it did drop out of the Canadian market due to uncertainties whether or not they would remain a gambling payment method in Canada, so it may be less common to find. However all of the above online casinos accept Neteller so you can make deposits and withdrawals easily if you still hold an account with them. Whichever method you choose, these online gambling establishments offer secure deposit and withdrawal methods thanks to the protection of data encryption technology employed by major financial institutions around the world. Start playing online keno for real CAD money at several of our top recommended sites, such as RoyalVegasCasino.com – the best in the market for high-quality Microgaming keno and fair payouts.